I took a cooking class back in high school. It wasn’t Home Economics or Family Studies; it was a week-long course at the local college that was meant to teach us the most basic techniques of the professional chef. It was most likely offered in the hopes that the course would catch the attention of at least a few of us, and that we would return after graduation for the culinary program. We learned how to make fresh pasta, French vanilla ice cream, chocolate truffles… I have very fond memories of that class, and not just because I got to spend a week away from home. At the end of the knife-work day, the dish that we were expected to prepare the chef’s version of cream of carrot soup. I really love the recipe, so I kept my copy and have been tweaking it ever since. So long as you skip the optional ingredients, my version is dairy-free, tree-nut and peanut free, gluten-free, and can be made vegetarian/vegan if vegetable stock is used instead of chicken stock. It’s also extremely healthy! It’s also slightly sweet, and not from adding sugar but from sweating the vegetables before boiling them — perfect for serving to picky eaters. 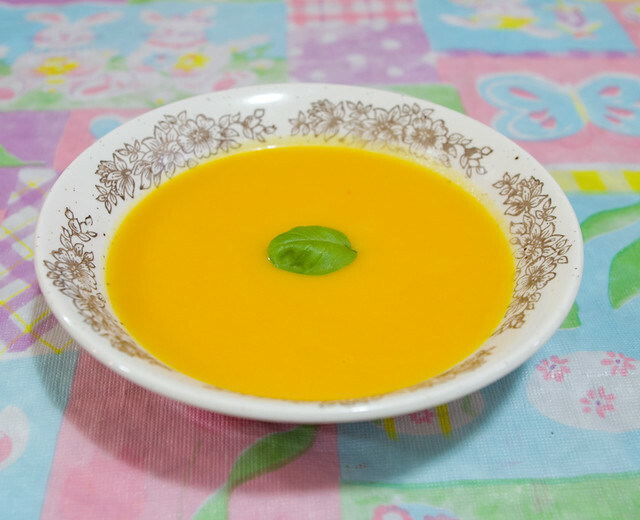 I make my cream of carrot soup in large quantities because it freezes really well, but if you prefer your soup fresh, I’d recommend halving or quartering the recipe. As written, it can be made using a 2.27kg (5lb) bag of carrots, which results in about 1.5kg after peeling and slicing. I like using Naturally Imperfect carrots, which are cheaper because they’re not visually perfect, but they taste just as good. Honestly, it’s all going through the blender anyway. All weights indicated are measured after peeling and chopping. Heat the oil slowly on medium-low heat. Add the carrots and onions to the oil. Sweat the vegetables until the onions are translucent and the carrots are about half-cooked. Stir often. Do not let the vegetables brown. Bring contents of pot to a boil. Simmer until all vegetables are tender. Once all of the soup has been pureed, return it to the stock pot. Gently bring the soup back to a simmer. Serve in a bowl or soup dish. *Chicken broth may be replaced an equal amount of vegetable broth, or homemade chicken broth, or a mix of 2.25L water and 2.25L stock made from chicken bouillon. Posted on April 18, 2017 April 26, 2017 by owntwohandsblogPosted in Cooking, RecipesTagged carrot, food, recipe, soup, vegan, vegetable, vegetarian.